Author, Jon Scieszka, has dedicated his life to inspiring boys to read, and he's succeeding. Not only did he serve as the National Ambassador for Young People's Literature. He also created the popular Guys Read website, and he publishes a Guys Read anthology series. The latest addition to the Guys Read library is a real treat for middle grade readers (both boys and girls). 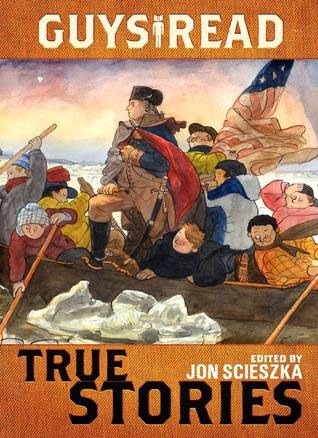 In Guys Read: True Stories, Scieszka has compiled outrageous, amazing, and sometimes scary, informational stories from ten authors including Steve Sheinkin, Sy Montgomery, Candace Fleming, and Jim Murphy. Readers will feel what it's like to be stranded in the Sahara Desert with Captain James Riley, study tarantulas in French Guiana, and learn about the sometimes painful history of dental care. Fans of Nathan Hale's Hazardous Tales will appreciate Hale's graphic novel vignette about pioneer Hugh Glass set in 1823. There are also science poems by Douglas Florian, a memoir about growing up in Vietnam by Thanhha Lai, and a biography of Muddy Waters by Elizabeth Partridge. Each chapter begins with an illustration by Brian Floca and ends with a bibliography of sources. The beautiful thing about Guys Read True Stories is that it's going to make everyone happy. History and science buffs will love these unbelievable (yet true) stories, reluctant readers won't be able to put it down, and teachers can use the book as a mentor text for writing or as an exciting read aloud. The most difficult aspect is deciding where to shelve it in the library. Do you put it in the series section with the other Guys Read books, shelve it with short stories (800s), or place it in general knowledge in nonfiction with the "survey" books? The answer is to put it on display and watch it get scooped up by the readers in your library.